words on each page so a surname search will not always work. Thanks for this, Al. This is a tremendous new tool. Note: Google has changed the interface to search the archives. The new format appears below. And , amazingly, here's what showed up! The entire newspaper page is returned. Here I extracted just the article. The headline shows up in blue. The search term is highlighted in yellow by Google. Get a coffee and take this new toy out for a spin! etc which are of interest to me , is there a way that I could high light copy and paste to use them in my family tree? There are a couple of options re saving the image in order to print it. For XP its a bit more complicated. 3. Paste the clipboard to whatever image viewer you normally use. steps 1 and 2  and 4 above. I understand that some browsers (Opera ??) have a built in feature that does the job. capture the whole image in one screen capture (more than one screenful). family tree program or into your word processing document. for just getting a screen capture as seen in the image included above -- the "Many Happy Returns" article. I'll try and document this process later this week. If you decide to buy it, it costs $50.00. to Birth, Marriages and Deaths sometime later this year. Thanks, Lesley. This will be a very useful resource for Ottawa area researchers! married or died, you can browse the paper looking for him or her. Huge selection which includes Ottawa and Bytown newspapers. Just in case this site is useful, think we talked about it before maybe. (above) and click on "Collections". The records are searchable online. Also, the Ottawa Journal is now available in a searchable digital version online at newspapers.com. This site is a pay site but can be searched online for free at the Ottawa Branch, Ontario Genealogical Society Library. 100 Tallwood Drive at Woodroffe Avenue, just south of Centrepointe. 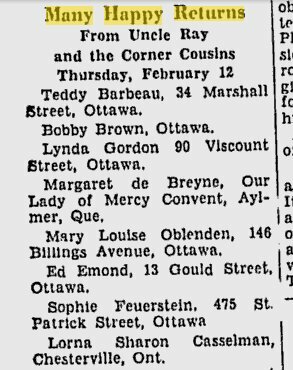 See some marriage and death transcriptions from the Ottawa Union newspaper. also, the Ottawa Journal can be searched online at the Library of the Ottawa Branch of the Ontario Genealogical Society.